Faith is mentioned in the Bible over two hundred times but not all faith is the same. 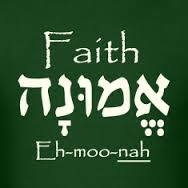 There are several definitions, expressions or variations of faith. For example, we can have faith in God, we can worship God and express our love for Him, but like the disciples we can still lack faith to believe in His miracles. On four different occasions, Jesus rebuked His disciples for their lack of faith. “Oh, you of little faith” (Matthew 6:30; 8:26; 14:31; 16:8).